Why did the dinosaur cross the equator…but choose not to live there? New research from the University of Southampton and international partners has uncovered the mystery of why large Triassic dinosaurs took more than 30 million years to populate the tropics. For years, palaeontologists have had different theories about why they could find no evidence of large, long-necked, herbivore dinosaurs (sauropodomorphs) living at low latitudes, until at least 30 million years after they first appeared on earth, and 10 to 15 million years after they became abundant at higher latitudes (both north and south of the equator). 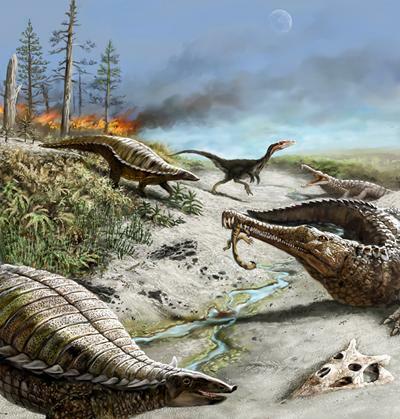 Published today in Proceedings of the National Academy of Sciences, the new research suggests a highly unpredictable hot and dry climate, linked with elevated levels of CO2, prevented larger herbivore dinosaurs from inhabiting the area. The climate, characterised by wet seasons in some years and extreme droughts in others, was punctuated by raging wildfires every few dozen years that reached temperatures of up to 600° Celsius. The conditions would have made it difficult for abundant vegetation to grow and survive; vegetation that the Triassic predecessors of more well-known Jurassic sauropods (like Brachiosaurus, Diplodocus and Brontosaurus) would have fed on. Scientists took rock samples from a location called Ghost Ranch, in New Mexico, where a number of Triassic dinosaur fossils have been discovered. The rocks were deposited by rivers and streams between 205 and 215 million years ago, during the Late Triassic Period. After analysis of the rocks, by crushing the sample and separating isotopes of the elements carbon and oxygen using an electromagnet and counting them with high-precision detectors, the team were able to ascertain changes in ecosystem productivity and estimates of atmospheric CO2 levels. They also determined estimates of wildfire temperatures (from fossil charcoal), the types of plant living in the region (from fossil pollen and spores) and the types of vertebrate animals living in the region. The study Extreme ecosystem instability suppressed tropical dinosaur dominance for 30 million years was funded by the US National Science Foundation and various other bodies.